Discover incredible face drawings and makeup styles with Ladybug! First, lets go through a quick spa treatment to get a flawless skin! Apply face masks to get rid of the pimples and clean up the face, then let the fun begin! Try on amazing star eye shadows, cute and long lashes and complete the look with the most amazing face drawings ever! 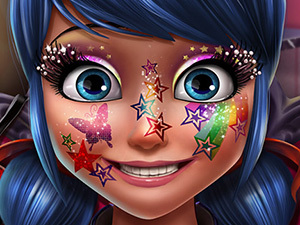 Get creative with Ladybug and find the perfect makeup look for her.